Kit loved her family’s traditional waffle dinner by the Christmas tree! 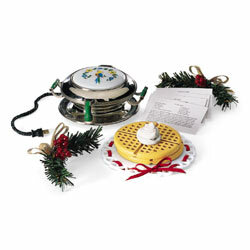 Her pretend waffle iron with its porcelain top comes with a ceramic platter, two pretend waffles with whipped cream, and two artificial evergreen swags. Follow the recipes to maker waffles for your own family!